NOTE: Click on the pictures for a larger high resolution version. 2010 was a busy year for travel. I documented travel to Kenya, Tanzania and Mozambique in Part 1. 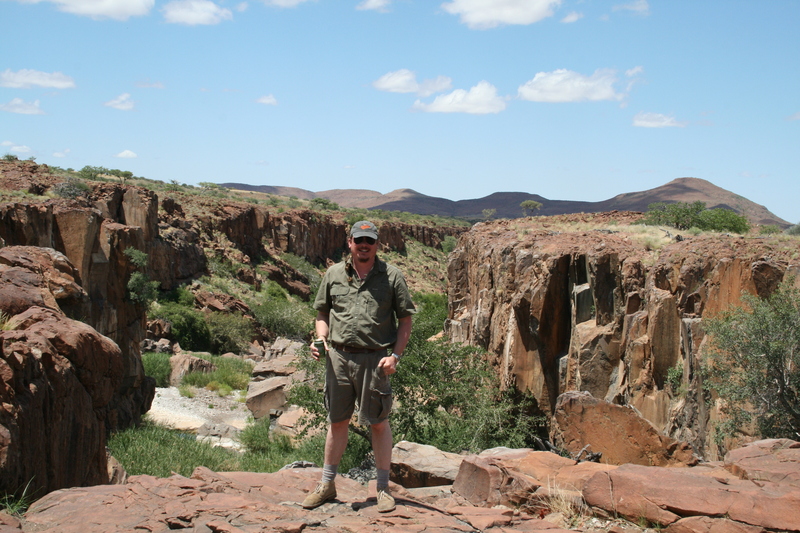 I also made two trips to Namibia in 2010. The first, in February, was to participate in a rhino capture operation in Etosha National Park. Those photos are documented here. The second, in July, was a trip with my father to celebrate his 60th birthday, which will be documented in Part 3. 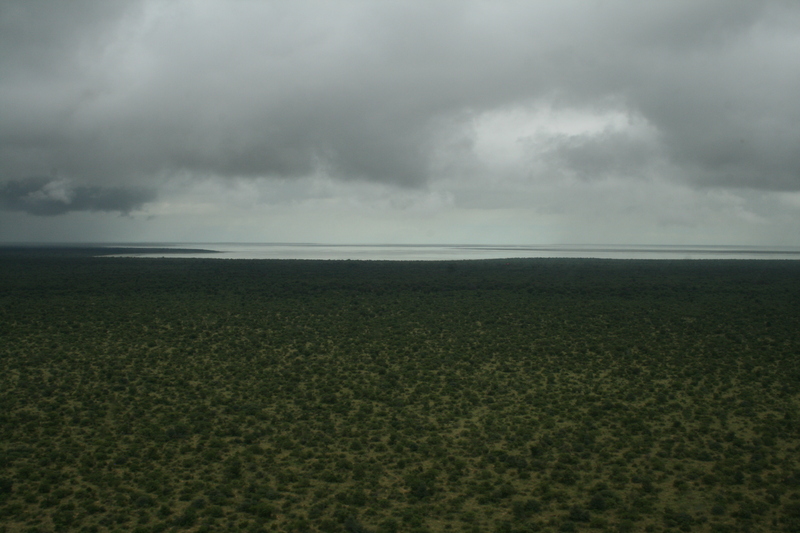 It was raining a little when we were in Etosha. This is a very dry place that only gets around 17 inches (430mm) of rain per year, and almost all of that occurs during the hot summer months of January and February. This rain transforms a dry and dusty landscape immediately into a green and wet oasis. 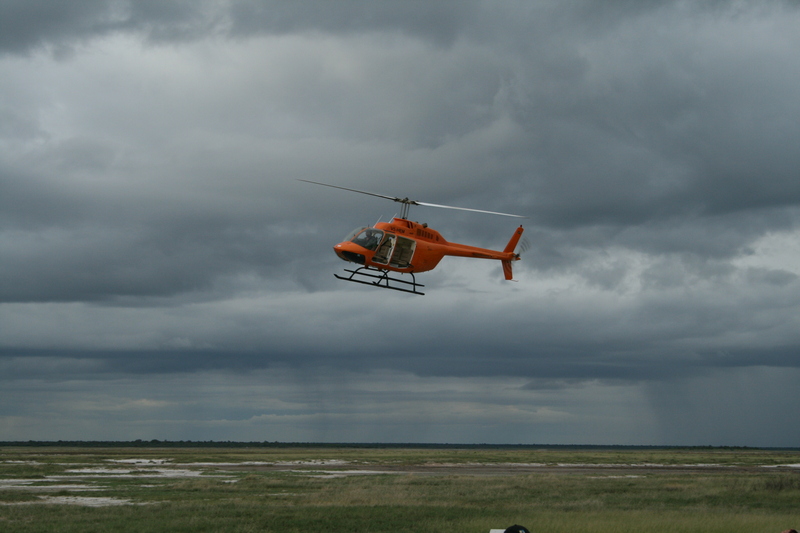 Here the capture chopper is coming in for a landing to pick up the rhino capture team. Rhinos are darted by a veterinarian from the air, and then a ground based team comes racing in to quickly take care of the animal and do the necessary procedures; either marking it, fitting it with transmitters, or crating it for relocation elsewhere. 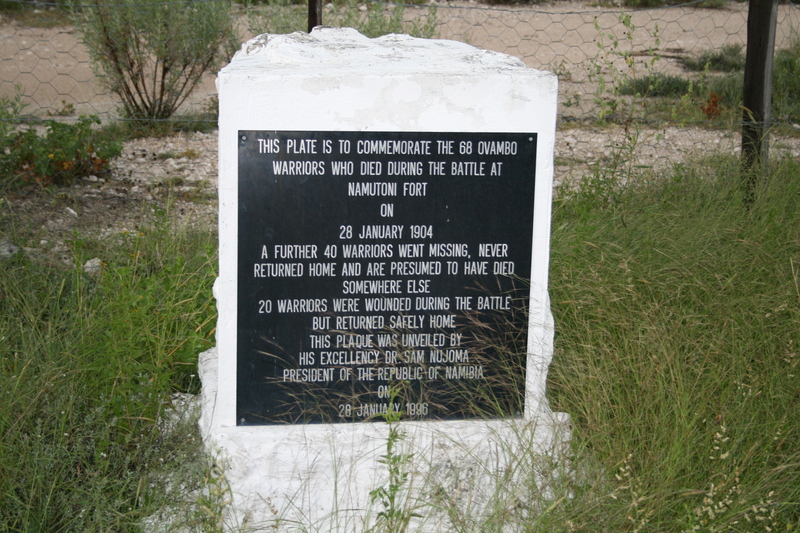 Our capture operation was based at Namutoni, the site of a massacre during the German colonial era, as commemorated on the plaque below. Memorial of Ovambo Massacre, Etosha, Namibia. 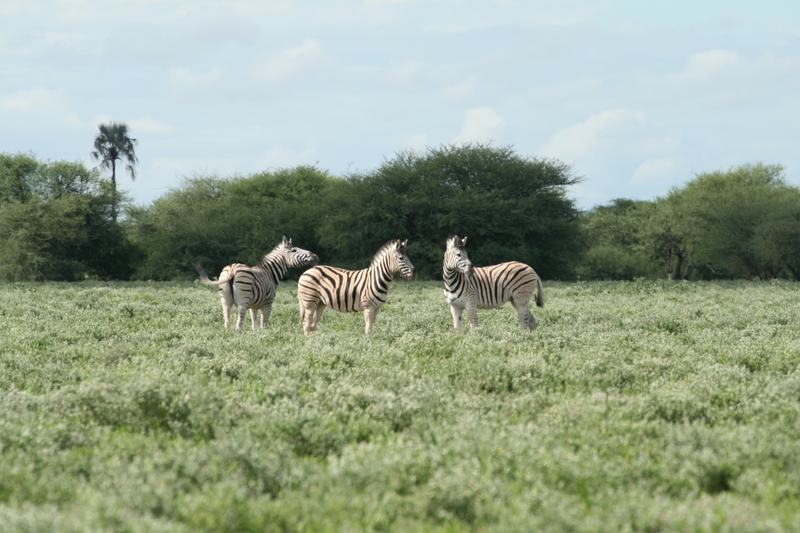 During the rainy season Etosha is transformed into a green and flowering paradise. 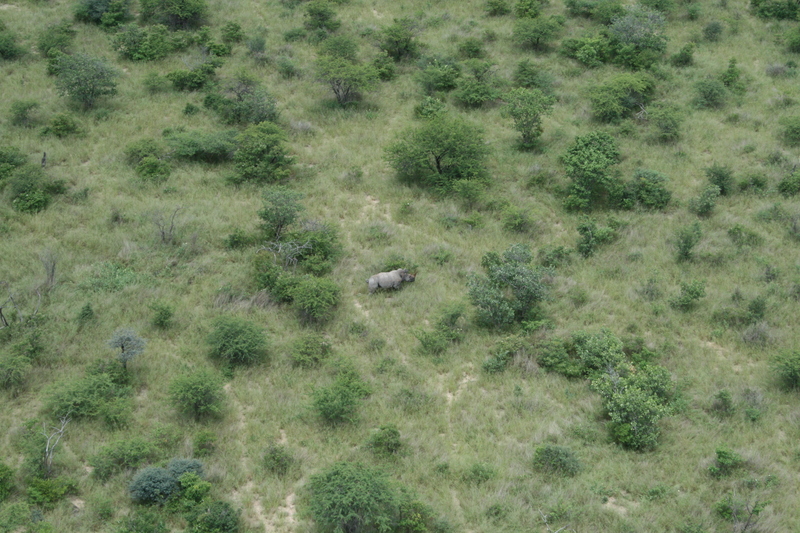 A white rhino as seen from the capture helicopter. 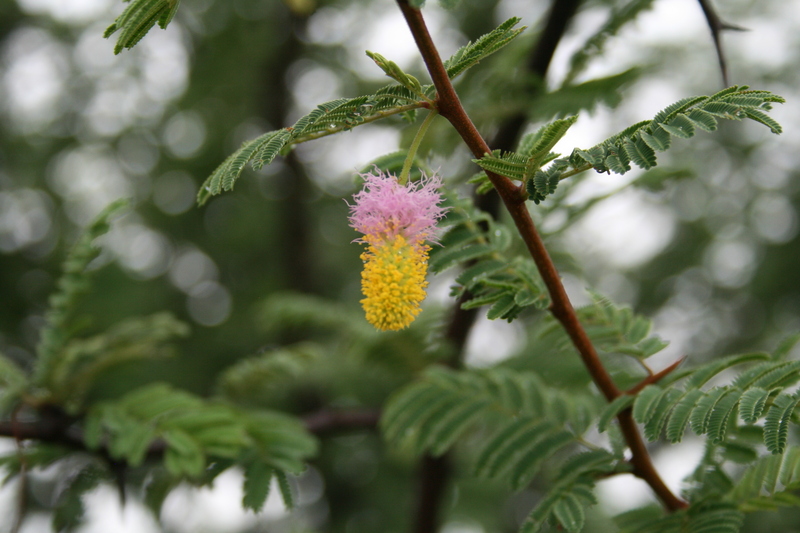 The green and sometimes dense bush can make it hard to spot animals during the rainy season. White rhinos have been reintroduced into Etosha and are thriving. A female elephant flares her ears at the helicopter, protectively guarding her calf. Etosha’s elephant population has been stable for many years and is thought to be naturally kept in check by the prevalence of anthrax, which keeps the population from growing overabundant. The vast Etosha pan is the centerpiece of Etosha National Park. The park itself is the size of New Jersey, and the pan itself makes up about a quarter of the park, an area roughly the size of Rhode Island. The pan is dry most of the year, but in exceptionally wet years it can fill with several inches of water, and fish are even sometimes seen in it. The water is gone by the onset of the dry winter months, leaving cracked and salty earth covering sticky mud. 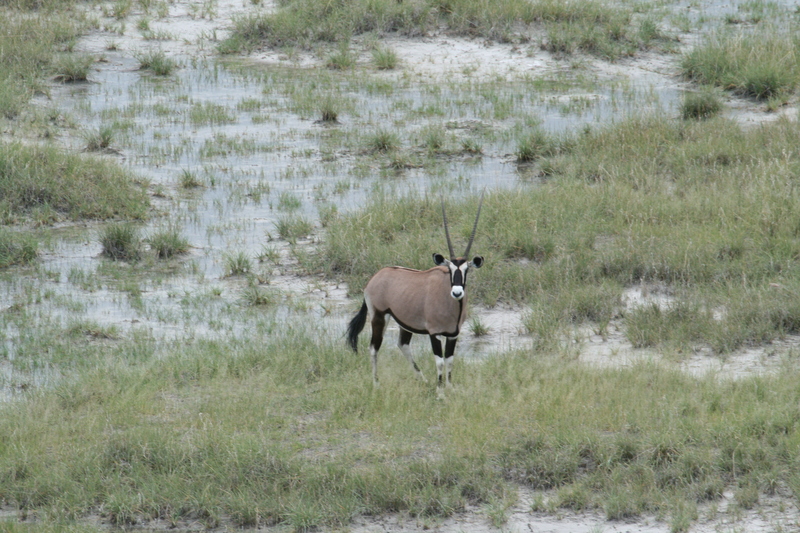 A Gemsbok prepares to run, startled by the helicopter. When the Etosha pan fills with water it supports tender grass at its edges that attracts wildlife. 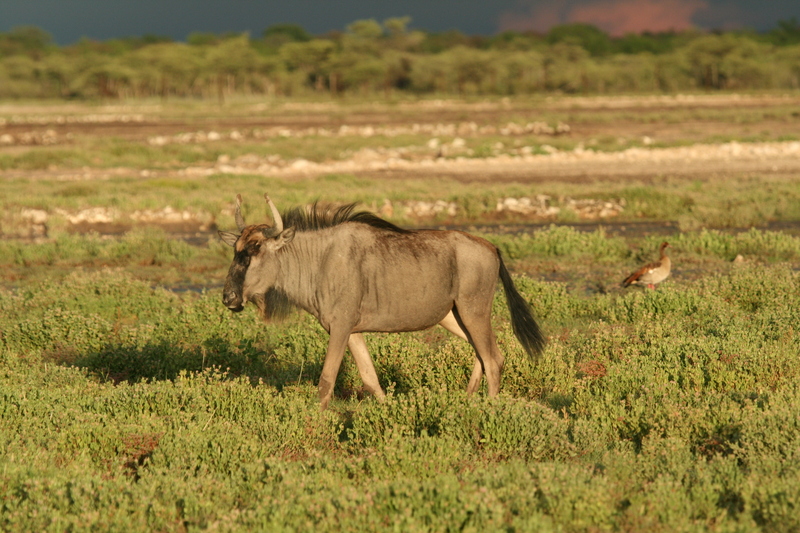 In historic times Etosha was the center of a vast seasonal migration as herds came during the rainy season and dispersed in the winter months. 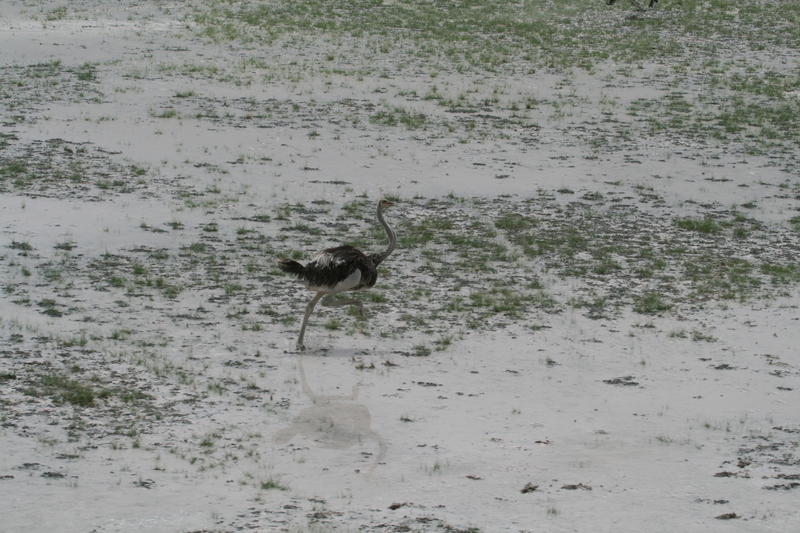 An ostrich runs from the helicopter in shallow waters at the edge of Etosha pan. 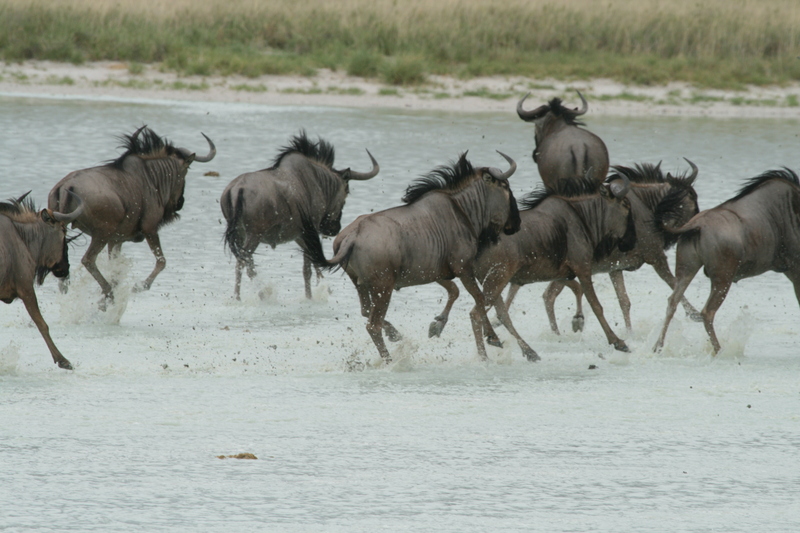 A herd of wildebeest run through one of the small streams that feed the Etosha pan. The Namutoni Fort as seen from the helicopter. 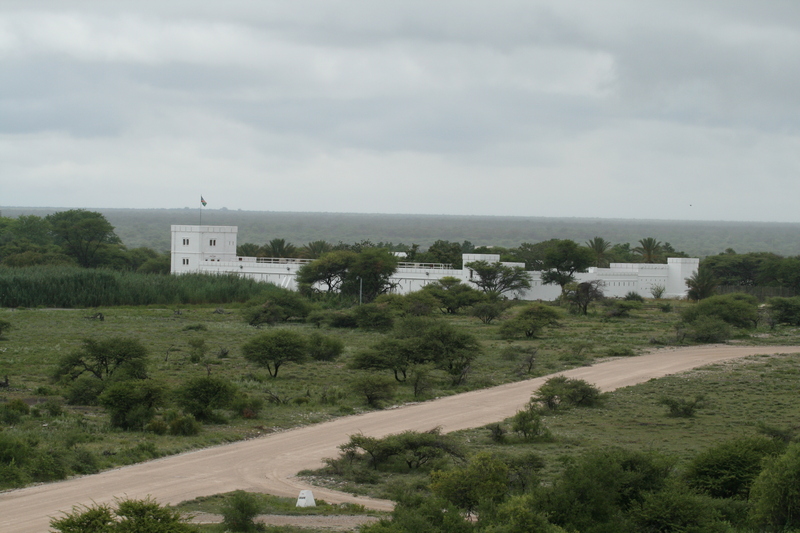 This fort was built as a frontier outpost by the colonial German government in 1904 and was subsequently destroyed before being rebuilt in the 1960’s. 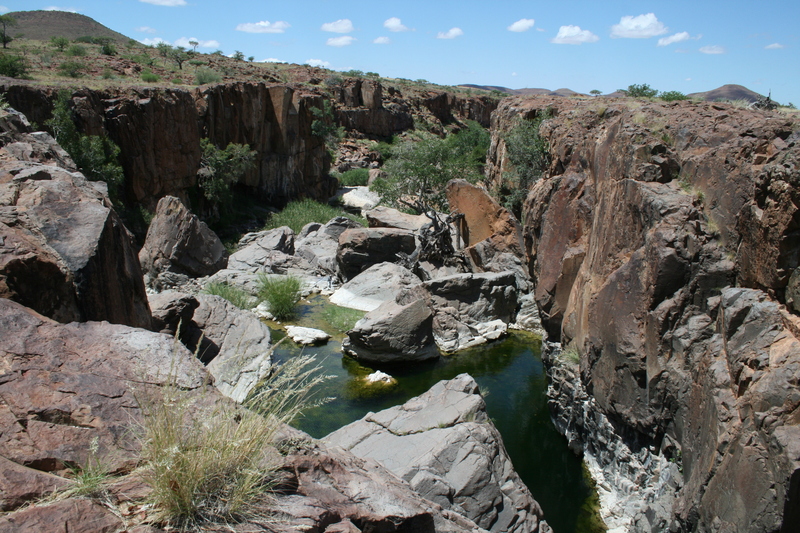 Today it serves as a tourism facility with an associated waterhole and campground. The view from the tower is remarkable, especially at sunset. A pair of lions near Namutoni. 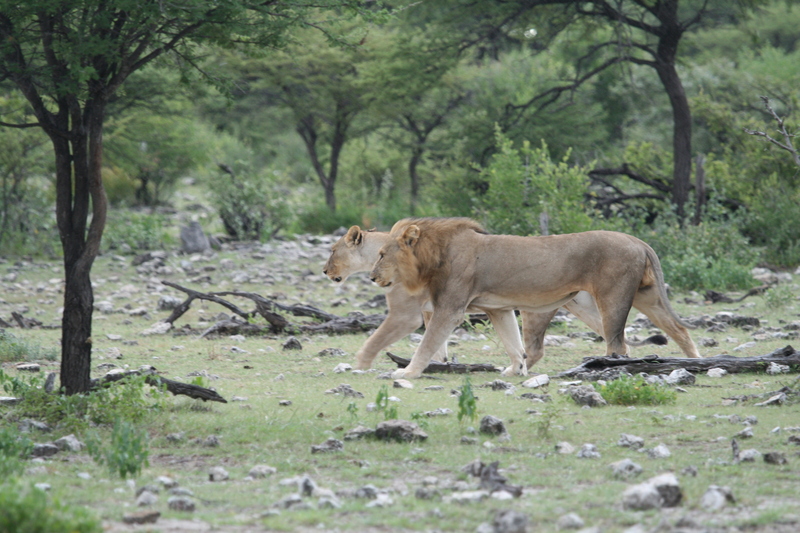 Etosha has a healthy lion population that has served as a source for recolonization of large parts of the lions’ range throughout northwestern Namibia. Where lions were almost gone 25 years ago, today they are coming back strongly due to a strong system of community based conservation. 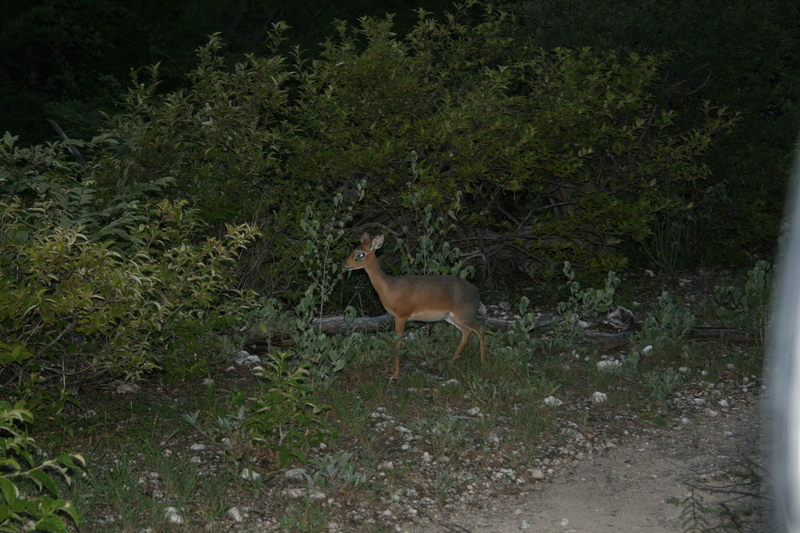 A Damara dik-dik on Dik-Dik Drive in Etosha National Park. All creatures great and small, Etosha is home to a healthy variety of wildlife, from the largest land mammals (elephant) to the smallest antelope (dik dik). Seeing this shy antelope is a rare delight. Damara dik-dik (Madoqua kirki), smallest antelope found in Namibia. Common zebra, also known as Burchell’s zebra or plains zebra (Equus quagga), are widespread and abundant throughout east and southern Africa. 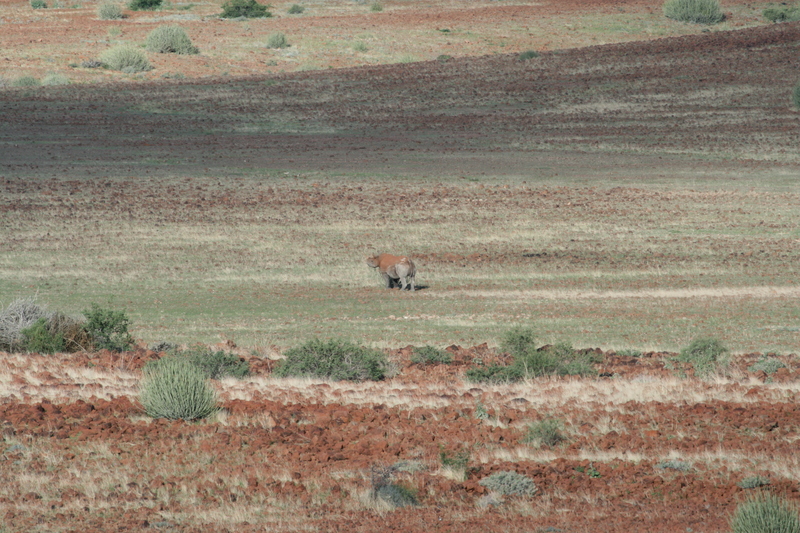 They are widespread in the northern and eastern parts of Namibia, giving way to the Hartmann’s Mountain Zebra (Equus zebra hartmannae) in the northwest. Common zebra (Equus quagga) Namibia. 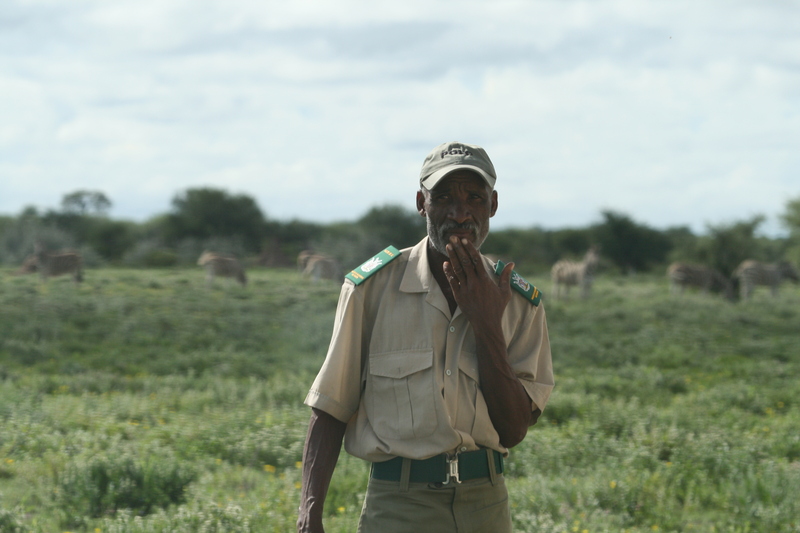 A Namibian wildlife ranger stands watch during a rhino capture operation. 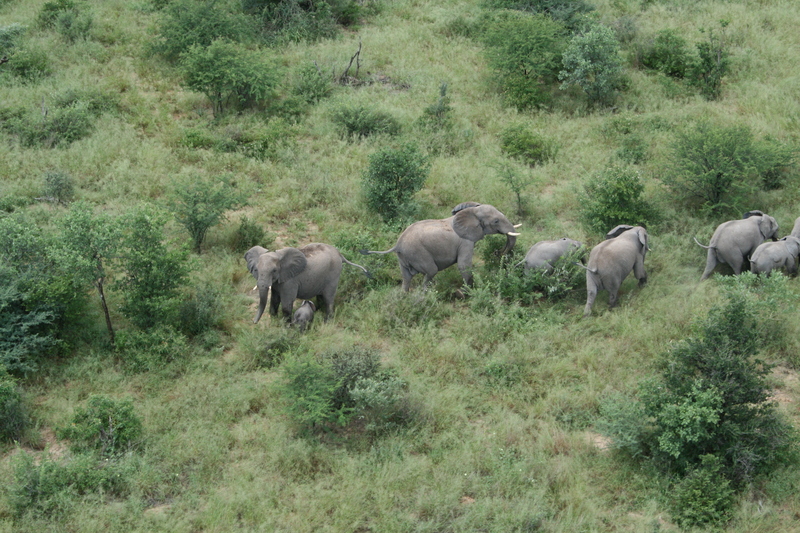 Thanks to a combination of well protected and well-managed national parks and an enlightened constitution that gives people the right to own and benefit from wildlife, enabling a system of communal conservancies, Namibia’s wildlife is thriving both within national parks and on private and communal land, which is unique in Africa. Helicopters sometimes break down, but surprisingly can be fixed with some ingenuity and a Leatherman tool. 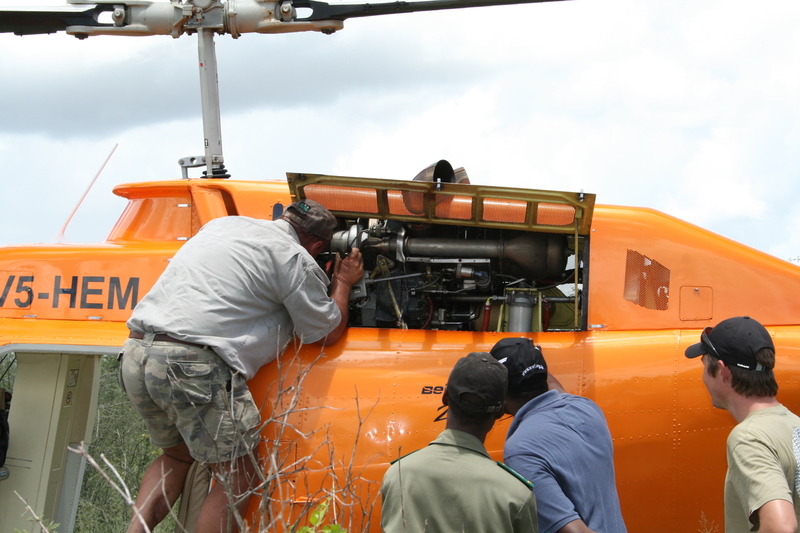 Roaring lions circling the chopper make for a disconcerting experience when repairs must be undertaken in the bush. 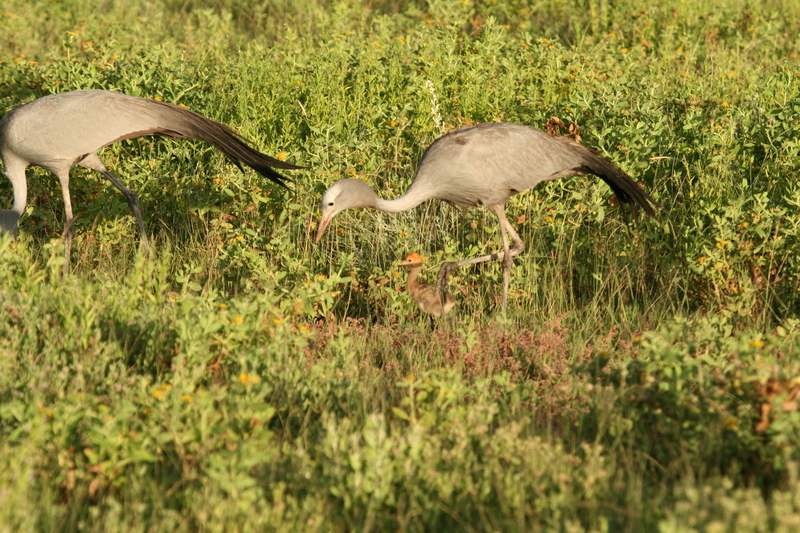 Namibia is home to a small and disjunct population of South Africa’s national bird, the blue crane. 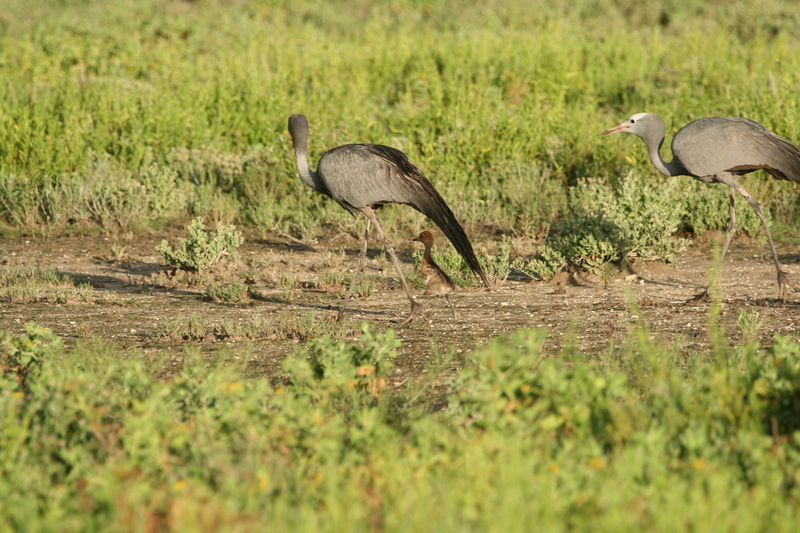 Approximately 100 cranes breed in Etosha and have been well studied by Namibia’s Ministry of Environment and Tourism. Late afternoon sun makes a perfect light for photography as a blue wildebeest and Egyptian goose pose for their pictures in front of rain clouds turned pink by the sun in the far distance. 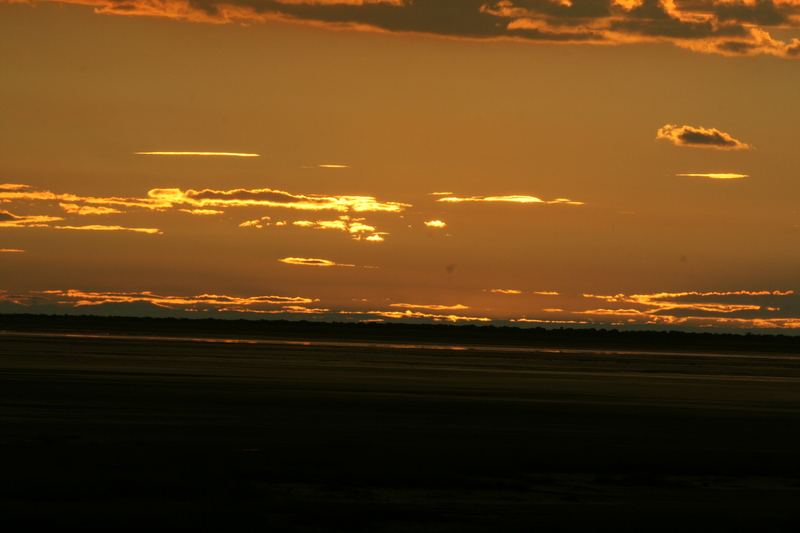 Each sunset in Africa is spectacular, but sunset over the Etosha Pan is particularly lovely. Sunset over Etosha Pan, Namibia. 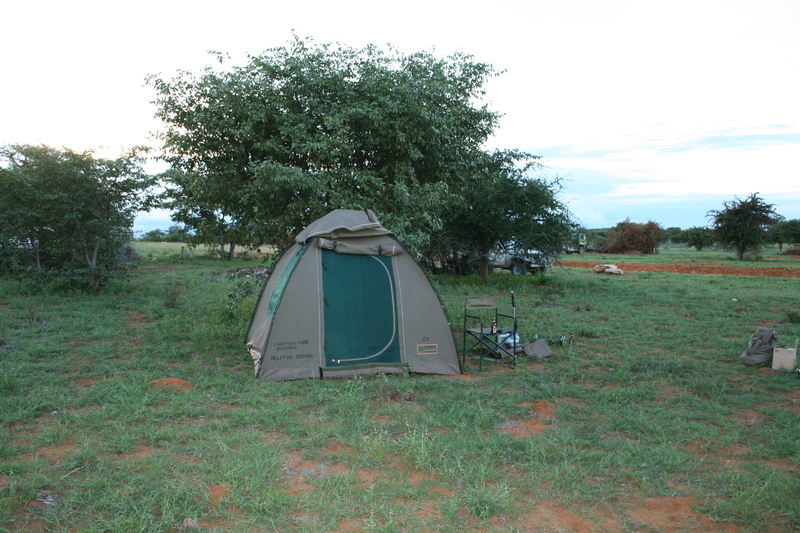 Home in the bush during a rhino capture operation. Falling asleep to the sound of lions roaring all round takes some getting used to and makes late night toilet runs into the bush an interesting combination of paying attention to one’s business while looking over one’s shoulder and scanning for eyeshine with a flashlight. 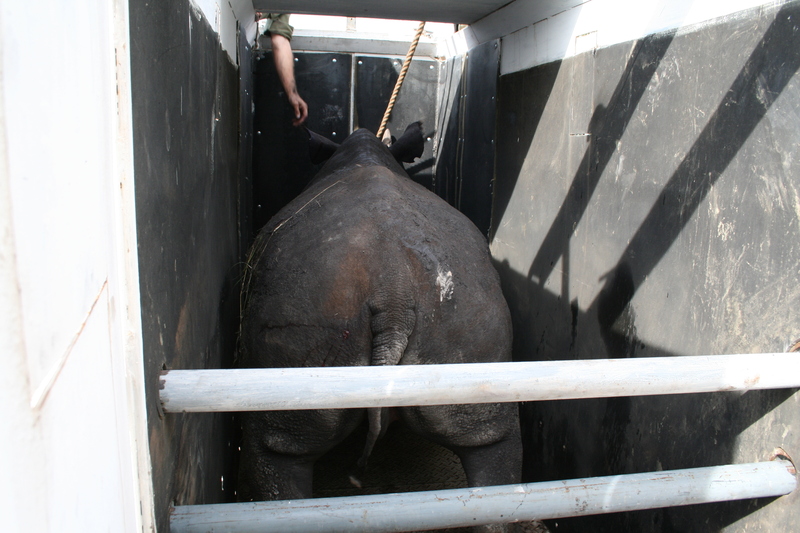 A captured black rhino loaded in a crate and ready to be moved to his new home. In order to maximize rhino population growth, it is often necessary to remove older males that are no longer able to breed but are still able to fight off younger males. This old bull had been fighting heavily with other bulls and his face was cut and bleeding from gouges made by other rhinos’ horns. A rhino capture and relocation is a costly and labor intensive operation that requires specialized heavy equipment in order to safely move the second largest land mammals to new habitats. 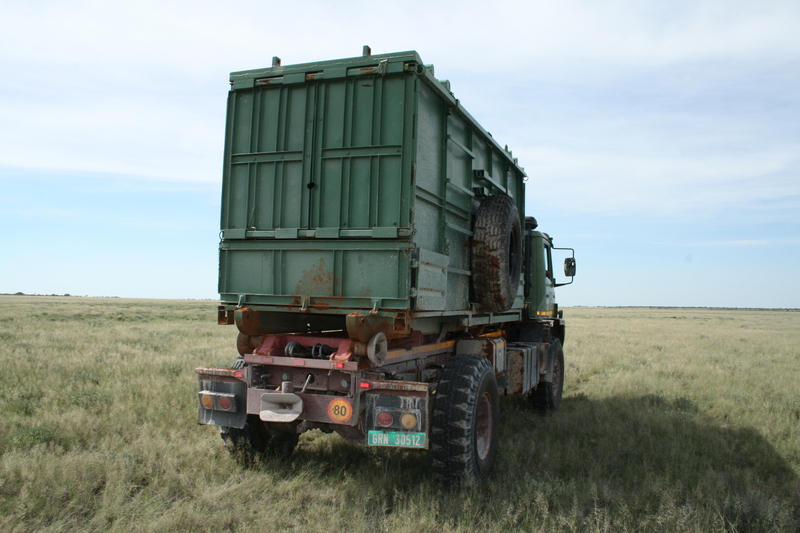 Rhino crate on relocation truck, Namibia. 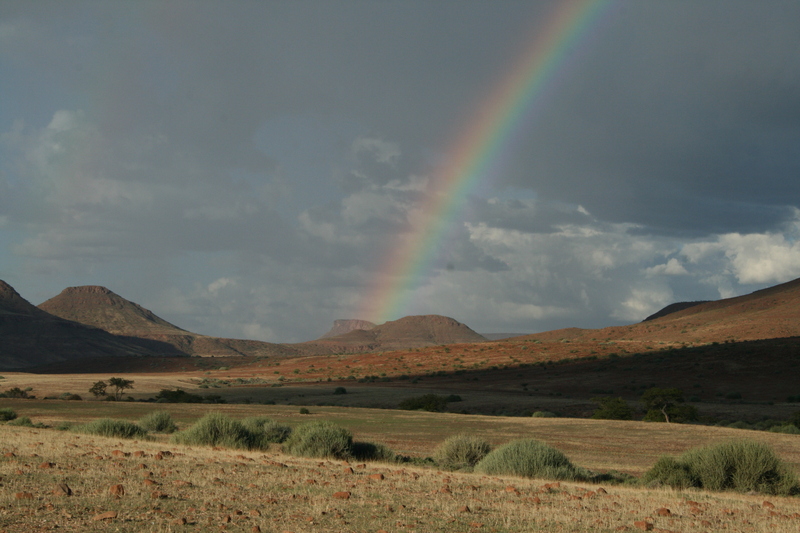 Namibia is home to spectacular scenery. In the desert where there’s water there’s life. We stopped for a break to enjoy the scenery and a cold can of Namibian bottled water (Windhoek lager). It’s important to remain hydrated in the dry desert air. A desert adapted rhino in northwestern Namibia. Though not a unique subspecies, these black rhinos have adapted to life in one of the driest places on earth. Here at the height of the rainy season only sparse grasses and shrubs can be seen. During the dry season this landscape becomes a moonscape of barren rock. A desert rainbow. 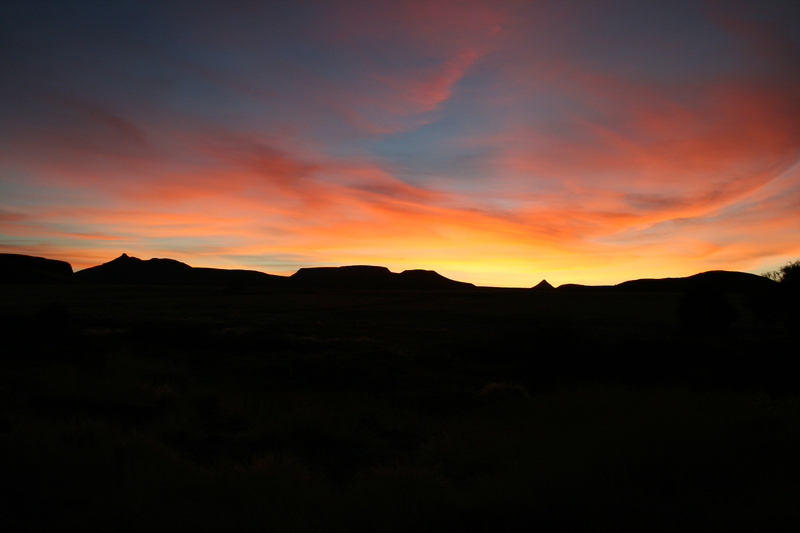 I contend that Namibia is home to some of the most photogenic landscapes on earth. Sunset at a place called Wereldsend, which literally means “world’s end” in Afrikaans. This remote outpost lies between Skeleton Coast National Park and the deserts of the Kunene Region. Intrepid settlers once tried to make a farm here, but today it serves as a research station for monitoring rhinos and lions. 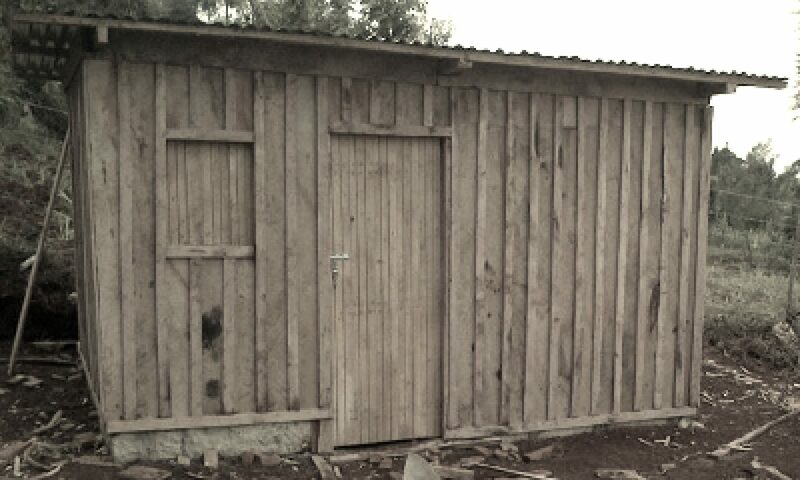 Next PostNext The shack is moving!